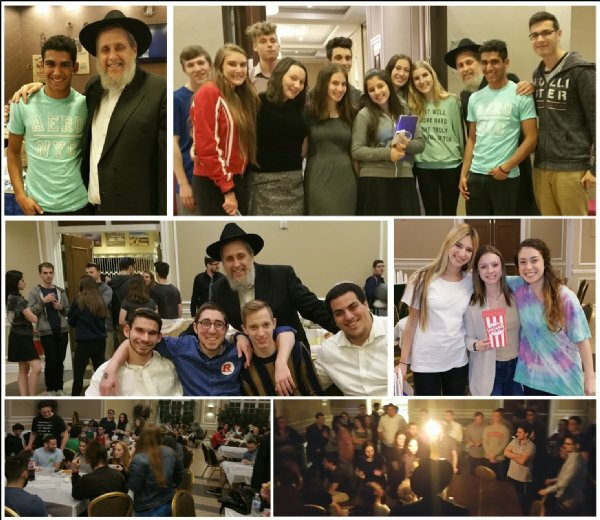 Over 130 graduating high school seniors attended Chabad’s Shabbaton Shabbat Experience and Rutgers Jewish Community Info Sessions, showcasing the myriad of activities and amenities for Jewish students at Rutgers. Chabad’s rabbis and resident advisors gave tours of Chabad’s 90,000 sq. ft. mega Student Center complex highlighting its luxuriously large dormitory suites, two synagogues – one Ashkenazic and the other, the only Sephardic student synagogue on any college campus in America, Chabad’s Dining Hall and International Coffee House and Food Court offering three scrumptious, hot meals a day, seven days a week, state of the art work out exercise rooms, quiet study areas, and active student leadership offices. Sixty prospective students were treated to a lively Shabbat experience together with over 350 current Rutgers students, along with 70 visiting high school students visiting as part of Rutgers University’s own Admitted Student Weekend program, converged into Chabad House and heard presentations from Chabad’s Administrative Coordinator Rivka Greenberg, Dorm Resident Assistants (RA’s) Micah Lebowitz, Leila Hertz, Danielle Shapiro and Yosef Serkez, as well as from Chabad’s Campus Directors, Rabbi Baruch and Sarah Goodman, and Chabad’s Educational Directors, Rabbi Shaya and Chayale Shagalow. Student programs spotlighted were Chabad’s very popular, Jerusalem JCafé held every Tuesday night featuring a consistent crowd of over 120 students enjoying a hot, Israeli buffet, desserts, live music, entertainers, crafts, and opportunities to unwind with good friends, the weekly Sushi ‘n Soul Torah Talk on Wednesday nights, Challah Baking with Rebbetzin Sarah Goodman on Thursday nights, the weekly Shabbat Experience Weekends, along with trips, concerts, community service opportunities, as well as many other fun programs and Jewish holiday parties held on campus at Chabad House. Rebbetzin Sarah Goodman held a breakout session on Saturday afternoon with the female participants, answering their many questions and giving them a tour of Chabad’s Mikvah, while Rabbi Goodman led a lively Chassidic-style farbrengen get-together with singing, campus stories, an upperclassman student d’var Torah thought, and personal introductions. With dorm occupancy already over 80 students, all prospective students are urged to register as early as possible to be assured of a room for the new 2018-19 school year, as acceptance is first come, first serve, and space is limited. To register, visit www.chabadnj.org or call Rivka Greenberg at 732 296-1800 ext 104. If you or someone you know is a prospective student and missed this Shabbaton, but would like to spend a Shabbat at Chabad, please call the same number. Come see for yourself why thousands of college students continue to make Chabad their home away from home each and every year.